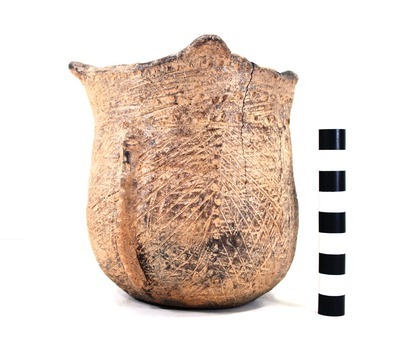 "41HS825, 2003.08.875, Burial 8, Vessel 53" by Timothy K. Perttula and Robert Z. Selden Jr.
DECORATION (INCLUDING MOTIF AND ELEMENTS WHEN APPARENT): The rim is decorated with horizontal brushing marks, and three rows of tool punctates pushed through the brushing. The vessel body has four panels defined by vertical appliqued fillets. Within the panels are horizontal brushing marks, a series of overlying diagonal opposed incised lines, and a single vertical tool punctated row pushed through the brushing. Pease Brushed-Incised jar, Burial 8, Vessel No. 53, Patton site.